Got this off the EBay a couple of days ago. It wasn't getting a lot of attention so I threw a low max bid at it and walked away. Checked the next day and I wound up winning it. Sometimes things just work out. 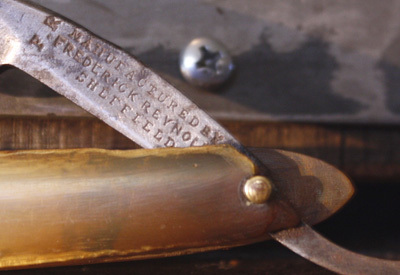 It's a Fredrick Reynolds barber notch with a near wedge blade. 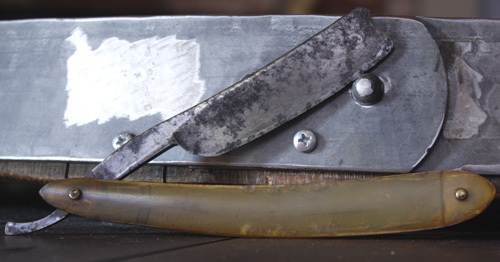 The blade is about 6/8" at the heel and 13/16" at the toe. The tip of the spine has two dents? or file worked areas?. There's quite a bit of surface rust and some pitting on the spine and around the pivot. The edge has several very small chips along the edge I'm confident will hone out. The horn scales have an integral wedge and are in poor condition, so new scales seems like the best plan. Overall I'm hopeful I can bring this back to shaving again. ScoutHikerDad, Geezer, BobH and 4 others like this. That will take some elbow grease but they’re darn fine shavers. ScoutHikerDad, Geezer and RezDog like this. Good luck on cleaning her up. A nice project. Cool project! Lots of potential, looking forward to see it finished. very cool, looking forward to seeing the finished product!! Be sure to set a bevel to make sure you can get a clean bevel before you put too much work into it. It’s either going to be a great shaving razor or a nice display piece. Raol and jfk742 like this. Thanks all. I'm looking forward to working on this one, but It'll have to wait a bit. I'm getting close to finishing a Packwood, so that first. This one will be soon after, may be some light cleaning to get a better idea of what's ahead worked in with my current project. RezDog - Yep that's one of the first things I want to look at. There's a bit of black rust near the edge and I want to see what's hiding underneath. The blade has a lot of meat, so I should be able to get to good steel eventually. BobH, RezDog and jfk742 like this. Nice project. 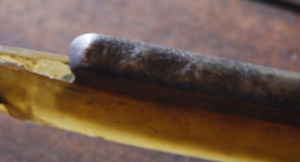 Don't trash the scales, you may want to fix them later if you start doing scale repair. I'll be saving the scales. I've repaired a set of similar horn scales on a W&B, but they were in much better condition. I've seen a lot of the techniques to rebuild missing areas, but I don't feel like I'm quite at that level yet. I may try and re-build these at some point. Right now I'm really enjoying the scale making process, which is also a factor for this blade. Frederick Reynolds razors are the best! Nice grab!